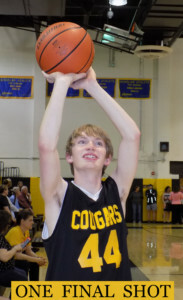 RESET ~ In 2015 the Honeoye Falls-Lima school district signed on as one of the 14 charter members of the newly established Section V Unified Basketball Program. To get everyone up to date, please allow me to restate the basic concept. Unified basketball is a program run by Section V in conjunction with Special Olympics, in which the competing teams consist of players with cognitive and other disabilities, as well as those without. The program is an official varsity sport with competitively played games refereed by certified officials. CHRISTMAS MORNING, SORT OF ~ When I woke up on the morning of April 30, 2015 I had never been more excited to get to the mailbox. I felt like a kid on Christmas morning as I woke up Dad and Deb to go get the paper. The reason why I was so excited was that we knew the Democrat & Chronicle was going to be publishing an article on the new HF-L Unified Basketball program and my picture was going to be in it. The whole thing was rather dreamlike. Of the 14 teams that participated that first year, the D&C had randomly happened to choose HF-L as the school that would be the feature team in its article on the new program. Then things got even more surreal when, of the 14 players on our team, the D&C chose me to be the feature player in the story. We went to the sports front page, but nothing was there. So we slowly and carefully flipped through the sports section again and found nothing. I remember Deb saying, “There’s no way we got the date wrong on this, is there?” What followed was one of those “timing is everything” moments. “Not the front page of the sports section,” Sandy replied, “the front page of the entire paper.” Dad, Deb and I grabbed the rest of the paper, which we hadn’t even looked at yet, and there I was. The Unified Basketball article, along with my picture, had made the very front page. The irony of this, as of course many of my faithful readers will realize, is that this would foreshadow some of my subsequent front page appearances on the Sentinel. As I stated in the first week of this article, my Athletic Director Brian Donohue was one of nine people involved in the first Section V meeting to implement the Unified Basketball program. So he has been an integral part of the process since its inception. I asked him what he has found the most rewarding aspect of the program and Mr. Donohue said, “I have really enjoyed the feedback from the parents of our athletes. Seeing and hearing their joy as they watch their children compete in an authentic athletic experience has been affirming. It has been awesome and extremely enjoyable and a reminder of the positive impact of interscholastic athletics.” I guess that pretty much sums it up! It’s so ironic that Dad and Deb were the first class to spend all four years of their high school careers at Honeoye Falls-Lima after the merger, and I’m in the first class to spend all four years of my high school career at Honeoye Falls-Lima after the introduction of Unified Basketball. Join me next week for a trip to the vet’s when we’ll visit with Dr. Gluckman at the Mendon Animal Hospital.